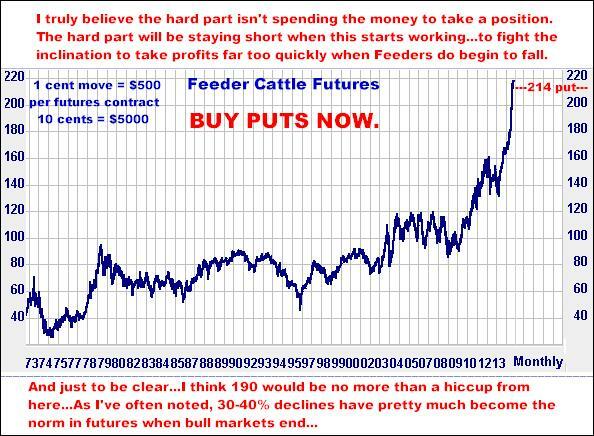 I MAY BE DEAD, DEAD WRONG BUT I BELIEVE FEEDER CATTLE WILL DROP 20-25% IN VALUE DURING THE NEXT 3-6 MONTHS…THIS TRANSLATES INTO APPROXIMATELY A 45 TO 55 CENT MOVE, OR $22,500 TO $27,500 PER FUTURES CONTRACT. In this business, when roaring (crazy) bull markets are over, they are OVER…and especially, I believe, when it comes to the meat markets. My expectation is the cattle markets will now go down longer and bigger than anybody could ever imagine, simply because that seems to be the way it ALWAYS is in this stuff…Bull markets DO end, but everybody then keeps flogging the same old bullish “story”…while prices spend 3-6 months just evaporating into oblivion…If you are an “ag” guy, just look at Corn. A year ago it was $7.25 and the talk was, “there isn’t any left. Prices will be good for years to come”. 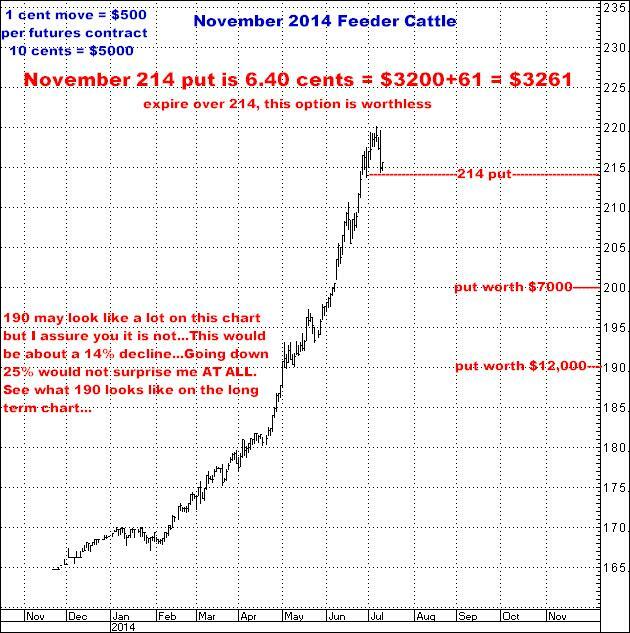 Today it’s trading under $4.00…Markets go up AND down…AND NOW IT’S TIME FOR CATTLE TO GO DOWN. I SAY, GET SHORT NOW AND STAY SHORT UNTIL YOU CAN’T STAND IT ANY MORE. If you have any inclination to do anything with this, I’d say, the sooner you do so the better.. Maybe I’m wrong, but I suspect we are finally “there”, that we have finally reached the peak of this insanity. The last few weeks have been nuts and my guess is all the shorts have been blown to hell. And anybody who IS considering the short side definitely doesn’t want to risk being short a futures contract, while at the same time, put options look expensive as all get out…all of which ARE the sort of factors found at every market top that inevitably “convince” traders to “wait and see what happens”…EXACTLY when it is time to make the serious move on the short side. I am short. I may be wrong, which could mean losing what you invest, but I think this is an absolute KILLER position to be taking. Right here. Right now. Buy a lot of time. Pay up and buy puts that are fairly close to the money. They aren’t cheap but the anticipated payoff isn’t small either. Then leave it all alone. Don’t even think about taking anything off the table for at least 60 days…or if the market trades 35 cents lower. I encourage you to call me if you want to do something with it. Option prices shown here include all fees and commissions. And here is the long term…Forty years of perspective…Do note there are easily 25 or 30 declines on this chart that are in the 25-30% range…I see NO reason to expect right now to be any different.